How to compare POS software companies | A blog about smart POS software for independent small businesses. How can I tell if your software is better than theirs? This is a question we are often asked since we’re a vertical market POS software company – we only offer software for selected retail channels. retailer was us to tell them how our software and dealing with us is better than they could experience from a competitor. Company blog (like this one). Software documentation like advice sheets. A quick comparison can show the best company to deal with. It could show one as old, out-dated and hard to understand and the other as fresh, relevant and genuinely helping a business. Comparing reports recently, a retailer chose Tower Systems as our reports were easier to follow and more valuable than equivalent reports from a competitor. Here is a good example of the value of the new searchable self-serve knowledge base on our POS software support website. 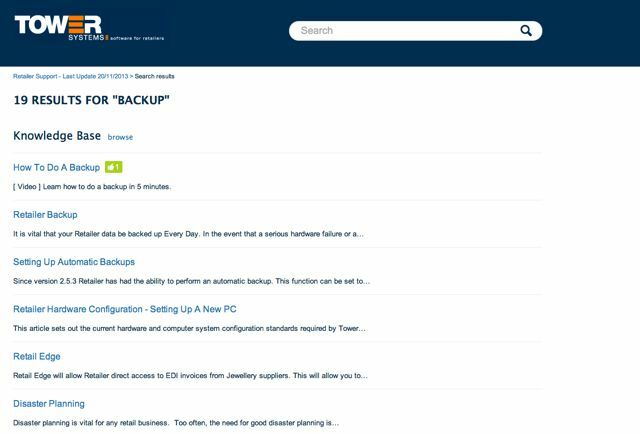 By typing backup into the search box, a customer is presented with a video on how to do a backup along with written advice on this including how to, when to etc. 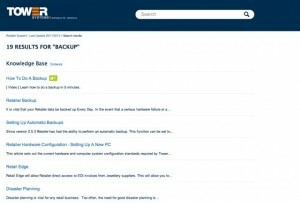 As the screen shot shows, customers can like content – one has liked the video on how to do a backup. In addition to liking, customers can provide feedback and add their own comments to all content we have loaded on our site. This two-way conversation can help us and help our customers improve the overall user experience. 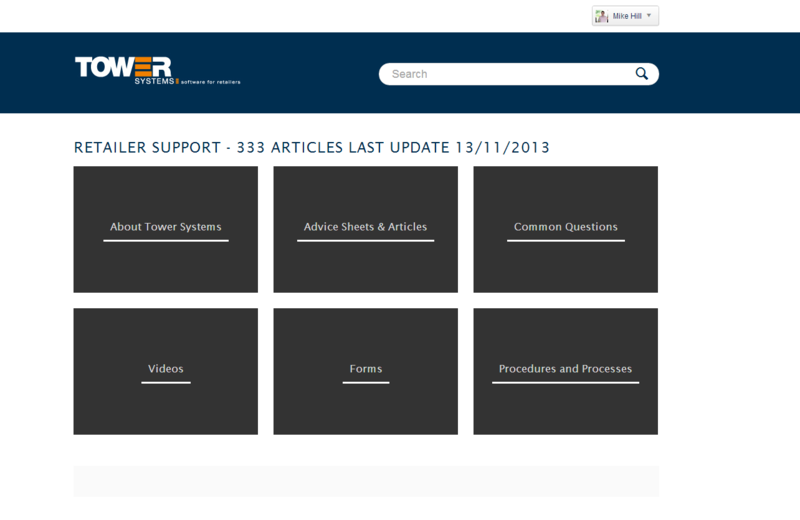 We are now two weeks into the new knowledge base being live and the feedback has been excellent. better still, the engagement has been fantastic. We can see that engaged retailers are learning more about our software. We love this! Our live help desk service continues and will continue. 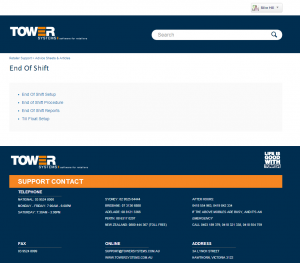 The new deeper online facilities are for customers who prefer self-service. They also help us sell the software as we get to show off more of what we do. The facilities also facilitate competitor comparisons. 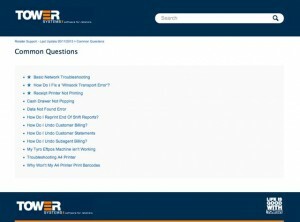 Tower Systems continues to expand the common questions area of the self-serve knowledge base launched by the company last week. Leveraging an already rich and valued based of knowledge on how to get the most from our software, the new common questions information separated our the most common calls received on our help desk and provides advice and assistance on a self-serve basis. This set of common questions advice is searchable using any text entered by someone using our new customer service portal. It can also be navigated through menus. Either way, our customers have access to unto date professionally presented advice. New common question information has been loaded this week. The engagement from our customers to the new self-serve facilities has been excellent. We continue to back the online facilities with a full-servicelive help desk through our national help desk facility based =in our Melbourne head office with local number support access from interstate and toll free number access from New Zealand. We have loaded a new welcome video to the public area of our website to make Mandarin speaking customers and prospective customers feel at home. 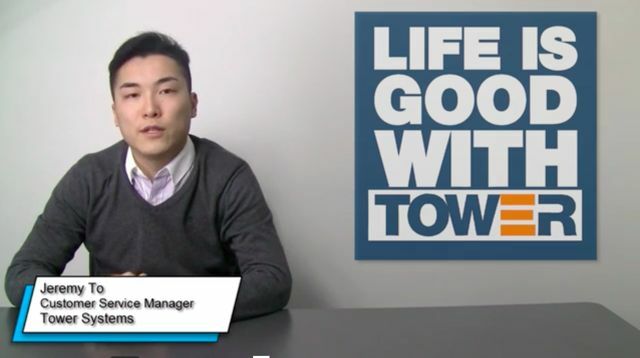 featuring Jeremy To, one of several mandarin and Cantonese speaking POS software help desk team members here at Tower Systems, this video welcomes customers who prefer to speak with us in Mandarin. This video shows off another point of difference for Tower Systems. We are thrilled to have people like Jeremy on our team – for his knowledge and his commitment to helping our customers access support in the language they are most comfortable using. Tower Systems serves hundreds of retailers, many of whom are newsagents, who prefer to access support speaking mandarin or Cantonese. that we offer the service has been a factor in the growth of our company. This new video was loaded to our website last week. More retailers are engaging with the online video based training curriculum that is a key part of our online self-serve customer support resource. While the 130+ videos that make up the library are also available on a single title bases directly from our new knowledge base / online help desk facility, we also provide access through a purpose written online curriculum management facility. The photo shows how one of our customers accessed a stream of videos to complete module of training. our users can a mange access to the videos for an employee – thereby tracking employee learning and engagement. This is a unique and valuable service offered by Tower Systems, one we are proud of as it presents us with an excellent point of difference for our Point of Sale software customers. The new self-serve POS software customer service facilities launched last week offer enhanced services to retailers using our Point of Sale software. 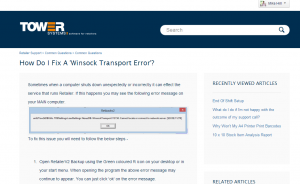 One example of enhanced services is the embedding of live links within advice provided. In the example shown in the image we provide advice on how to load a Christmas stock file. Users reading the advice are able to discover how to import the file and link immediately to the file to facilitate loading. This saves several steps, making their task easier. Bringing all information and resources together into one place that a retailer using our POS software may want to answer a question is improving user productivity and enjoyment. In creating content for our self-serve help desk facility we constantly ask ourselves: what else would a customer want or need to be able to complete this task or deal with this query? This is another difference delivered to Tower Systems customers through the Tower Advantage™ program. 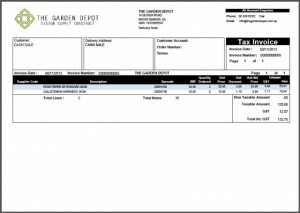 The Tower Systems Garden Centre software offers a range of customer invoicing options including this professional invoice produced directly from the software. Developed in consultation with garden centre owners and managers, this invoice and other garden centre software invoices, quotes and customer documents help garden centres using our software to represent themselves accurately and professionally – and in a way that meets the specific needs of the garden centre nursery industry. This is what being a specialist software company is all about – meeting the needs of the niches in which you serve by providing rich facilities tailored to the needs of your customers. The Tower Systems specialist pet shop software user numbers are surging on the back of excellent sales continuing to flow from the pet trade show last month in Melbourne. This trade show has been our most successful this year with many new installations now completed or being completed in the next few weeks. While our pet shop software has been tailored to the news of pet shop businesses, we are learning about more needs we can cover in the broader pet business marketplace. We are working with suppliers and retailers to enhance our software further and make our software even more valuable to retailers and suppliers. This is what we do as a specialist software company – we learn about needs and develop solutions to meet those needs. Flexibility in shopper loyalty programs from points to discount off next purchase. Smart customer marketing tools based on shopper habits. The ability to bundle items with special pricing for these bundles. 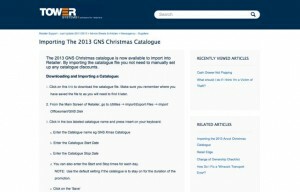 Support for supplier stock files and invoices – we have many stock files on our website. Smart reporting tracking sales by pet type, supplier and or sales person. 2013 has seen the number of jewellers using the Jeweller business management software from Tower Systems increase considerably. This sales success has been drives by word of mouth recommendation from existing jewellers. The more jewellers using the software, hundreds do so now, the more information we gain on how to improve the software even further. This, in turn, helps more jewellers come to ur user community and enjoy the benefits of a constantly evolving jeweller product designed for jeweller retail businesses large and small all around the world. From tracking sales to rewarding shoppers to managing the manufacture process to interfacing with suppliers, the Tower Systems jeweller software is packed with jeweller specific facilities that enable jeweller businesses to operate more efficiently and to drive more sales. Indeed, the jeweller specific facilities in the software reflect the specialist nature of many jeweller businesses and these facilities help jewellers differentiate their businesses from mass merchants. While computers are pretty resilient to the rigours of a busy retail environment, the most common problems we see relate to environmental issues that can be addressed. For example, cleaning some hardware components will make them less likely to fail. Disconnect your receipt printer. Turn it upside down. Open the tip. Tap it and see what falls out. Often, plenty of dust and other junk. You could also gently vacuum the printer. Turn your keyboard upside down and tap it the same as the printer. Paper clips and staples are especially damaging. With the power off, cables disconnected and the case removes, blow compressed air from a can through your computers. Make sure airflow in and around the computer is good. Use compressed to clean the vents of your monitors. make sure your uninterruptible power supply is working. They need replacing every few years. If you’re not sure, call in a computer technician and ask them to clean your gear. While we offer access to our live help desk services all weekend, retailers using our POS software also have access to our enhanced self-serve knowledge base and customer support and training resources. Our launch earlier this week of the enhanced facilities has expanded the services available to our customers on the weekend. Retail is a seven day a week business and POS software companies not providing access to their full suite of services seven days a week are not connecting with retailers and their employees. Our new facilities provide weekend retail employees access to even more services – including advice sheets, videos, common questions and other keyword searchable resources – and this plays out as a differentiating opportunity for us. 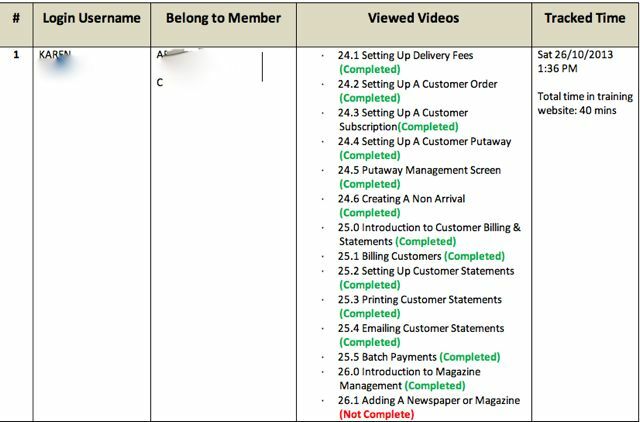 Embedded throughout the new customer service / knowledge based framework we added to our POS software website this week is transparency over escalation points in our business. We make it easy for our customers to know to whom to take concerns: right through to the owner of the company. We have found that such transparency is appreciated and rarely abused. Consistently reminding our customers of the escalation points in this new customer service resource is important. Too often software companies hide contact points and hide the details of the humans who provide their services. We go the other way – transparent publishing of details and the names of the people providing our services through to the leadership group of Tower Systems. We do this out of pride. Those who are not as transparent maybe do so out of fear. The new mobile access facilities launched by Tower Systems this week as part of the new self-serve help desk facilities for retailers using our Point of Sale software take POS software customer service in Australia to a new level. 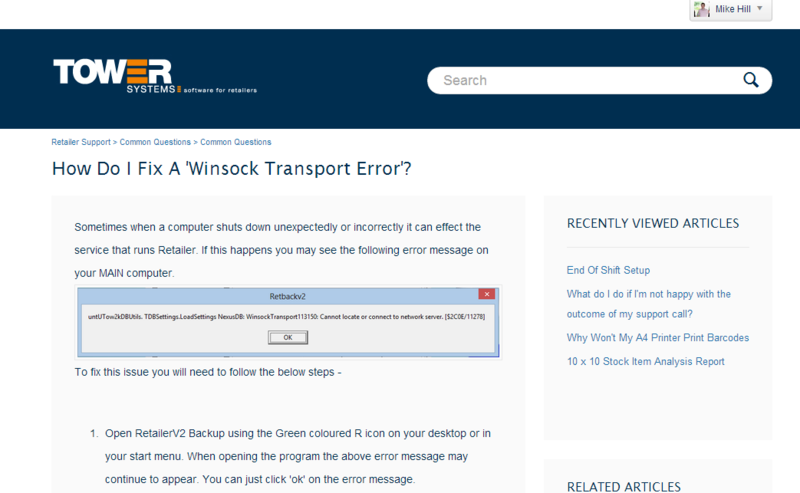 The image shows a screen on a mobile phone where someone is accessing notes on installing a new release of our software. Here our customers can access notes on their phone without having to use the computer on which they may be doing work. By releasing the entire database of advice sheets, customer service knowledge base and user training videos through mobile devices we have significantly enhanced the customer experience. While our users have had access previously, the new platform significantly improves the user experience thanks to completely new technology now deployed for our customers. 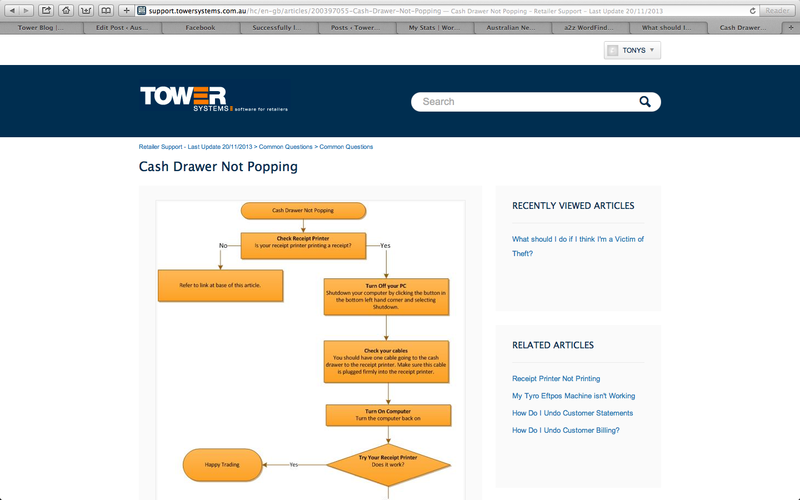 As part of the enhanced self-serve POS software knowledge base help desk facility launched by Tower Systems this week, retailers using our software have access to fresh content including this screen that guides easy resolution of a cash drawer not popping issue. 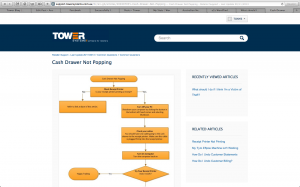 Following the flowchart retailers using our software can fix more than 95% of instances where a cash drawer is not popping. This advice can be easily found using menus in our new self-serve portal or by doing a keyword search in plain English. The power of user driven search is excellent. It’s fast, easy and 100% focused on the user outcome. The feedback from our customers accessing the self-serve facilities launched has been wonderful. The new customer service and support facilities on our website are also providing even easier access to our training videos. This screen show shows how the Touch Screen setup video comes up. Our customers can find this by navigating the menus or doing a search on one or more of the words. Providing access to videos from this new facility is in addition to providing access via the comprehensive professional curriculum based training platform that we also maintain on our website for our POS software customers. This new support and knowledge based access platform is all-encompassing. It’s rich in content from the launch on Monday. It’s also easy to access. We are thrilled to be delivering this for our customers. 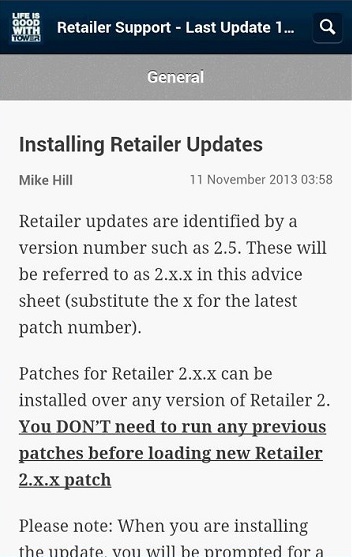 By facilitating user comments on all entries in the extensive knowledge based we have launched this week for retailers using our POS software, we have invited our customers to enhance the knowledge we share by adding their own knowledge and experiences. In the comment field on each entry of information our customers can ask questions or add from their own experiences. We’ve done this as we know shared knowledge is more valuable. Since our users are at the coal-face with our software they can help others by telling us and others what they know. This new extensive customer service resource has many other features that our customers are discovering as they engage more with the facilities we have launched this week. 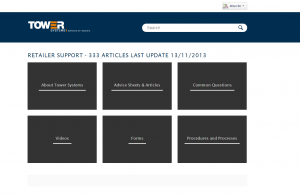 Tower Systems has added fresh content over the last 24 hours to its Point of Sale software knowledge base. The latest content focuses of questions from first-time computer users. It seeks to answer questions from non technical people in a non technical way. To serve non technical customers we are in some cases taking existing content and re-purposing it in a form that is useful to a section of our user community. In developing this new type of content we have been asking ourselves and some of our non-technical customers about common questions that come up, especially questions that are described in a more natural yet unstructured way. A key value proposition of the new self-serve knowledge base is that it makes help accessible to anyone at any time regardless of their technical skill or interest. 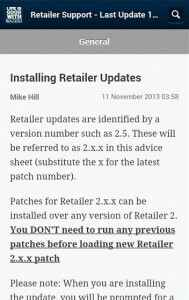 POS software customer service knowledge base mobile! In building the new customer swerve / knowledge base portal for our website we have ensured it’s mobile ready. 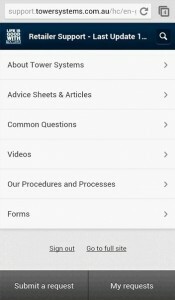 Our customers can access all the knowledge base facilities – advice sheets, videos, common questions and forms – on mobile devices including iPhone, Android, Slate and iPad devices. 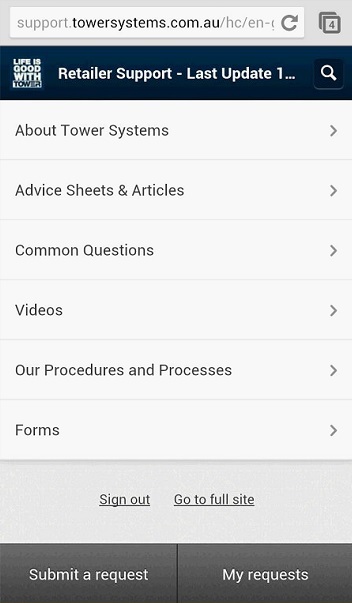 Making the entire package knowledge base resources available on mobile devices enhances the customer experience in that they can get answers to questions, learn and research our software from anywhere. This is pretty cool stuff and we’re proud to be leading in this space of mobile software support knowledge based access in our various vertical markets. To be clear, this is not an App. No, a mobile device accessible website is NOT an App. It’s been a week since we launched our new customer service / knowledge base facilities. The feedback from customers has been excellent. They love the easy search facilities, the new contact, the extraordinary video training library as well as the interactive nature of the self-serve support facilities. We’re thrilled with customer engagement. 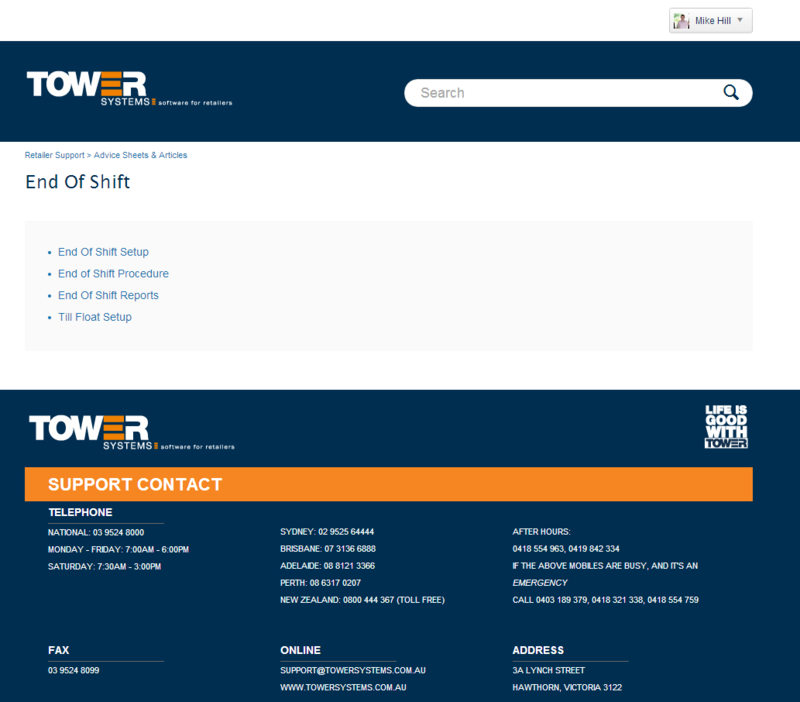 The enhancements to the backend of the Tower Systems website earlier this week include consistent packaging of advice and information to assist our customer to get more from their POS software. The screen shot shows the clean and professional way information is assembled, how we embed screen shots and how we write the advice for the non technical users so they can comfortably access help. From the writing to formatting to packaging, this new self-serve knowledge base / training / user advice facility through which our customers can access support information is a game changer in our marketplaces. It shows our commitment to refreshing not only the advice we provide but how we provide it. We are proud of adopting a worldwide best practice approach to making software support information accessible and understandable for the small business owners and their employees who use our software. The launch on Monday of our new online facility is the result of an extraordinary manpower investment and a considerable financial investment. 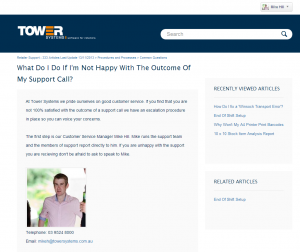 The new knowledge base / self-service customer service support platform is receiving excellent engagement from amount the tower Systems user community. With more than 1,500 page views in just over a day and plenty of terrific feedback we know we’re on a customer service winner here. 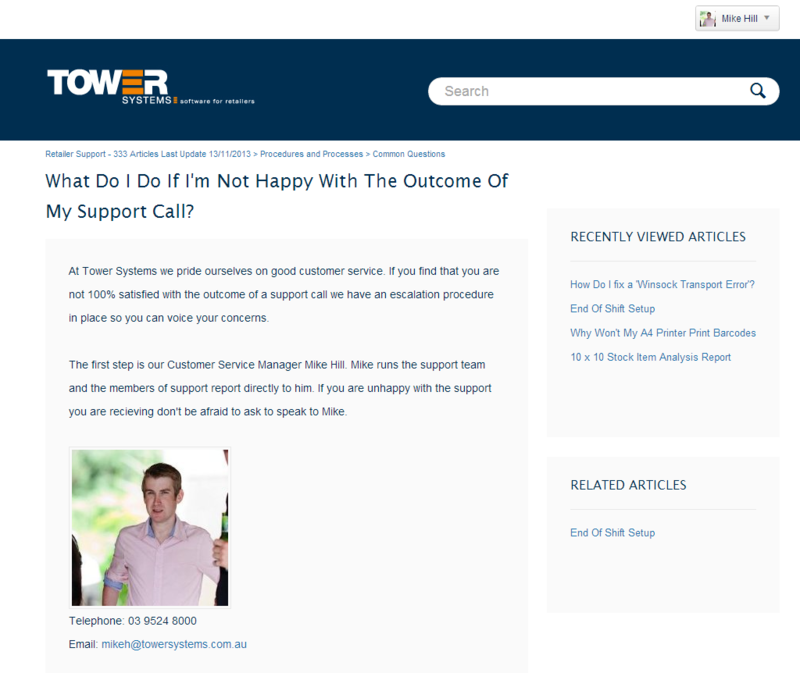 Check out the new online support platform here: http://support.towersystems.com.au/. If you go here without logging in you see the free content. Once you log in you get access to everything. 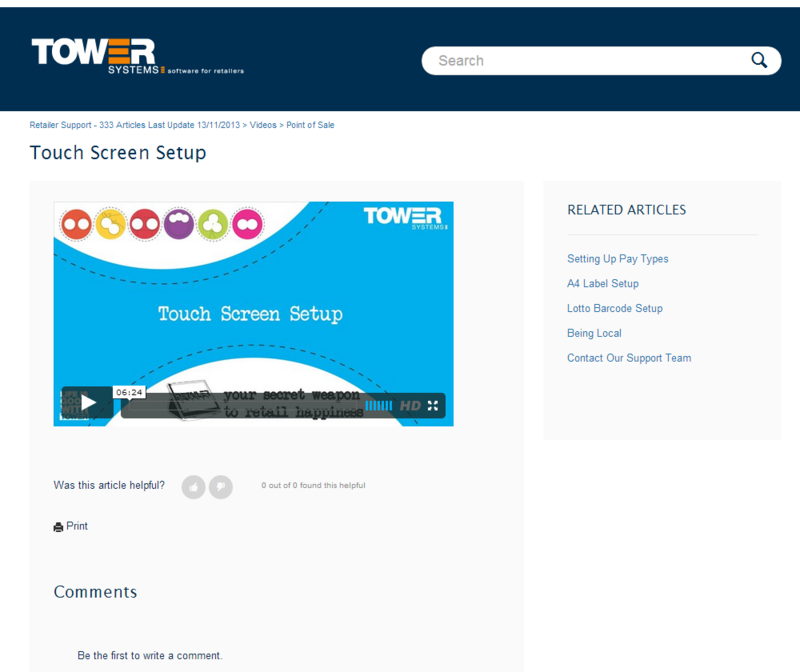 The new self-serve support / advice / video / training platform launched by Tower Systems yesterday contains fresh information and assistance on using our software. 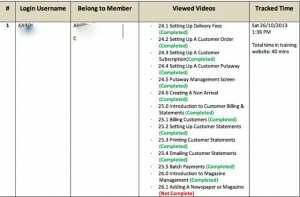 We have gathered information by topic: – the screen shot shows end of shift advice sheet content. In addition to making it easy to navigate by topic, our customers can search content using any keyword(s). The search is through all the content we have stored. We have lifted the benchmark for POS software support access. The professional assembling and presentation of information reflected on the professional approach we take in our software and in the support assistance we provide. It’s a terrific way to compare us to other businesses. Each screen also contains information on how to contact our help desk 24/7. We make contacting us for help as easy as searching our knowledge base. The launch yesterday of this new facility sets a new benchmark for POS software support. Whereas some companies focus on live one on one support and others focus on remote email or website support, we are offering enhancements of both – for the benefits of retailers using our Point of Sale software. This button has been added to the Tower Systems website. Clicking on this takes our customers to the new self-serve customer support facilities. You get easy access to our vast library of advice sheets, more than 130 training videos, an incredible knowledge base – and all of these resources are searchable. The content on the site launched today is broad and professional. New content will be added every couple of days, reflecting common user questions. More importantly, through the comment facilities our customers will be able to add value to our content. Click this button and you get to see professional POS software customer service in action. Tower Systems today launches another major online customer service initiative with a new self-serve platform of advice, training and information accessible direct from our website. This new facility is a one-stop-shop for people using our Point of Sale software who want to find answers for themselves. We have loaded this self-service facility with existing advice sheets, new advice sheets, all of our training videos, all forms for accessing other tools, conversation videos introducing our team, common questions – a live knowledge based of the questions our help desk team are most often asked and something called our procedures and processes – a section with information about us, our policies and how we do business. Every item of content we have loaded can now have comments made on it. This opens our extraordinary library of advice sheets, videos and more to feedback – we’re looking forward to this so we can learn. All content is searchable by keywords. We have used a worldwide renowned content management and delivery platform as the basis for this major website upgrade to manage all of the content and provide easy access. This allows us to focus on the content – our area of expertise. 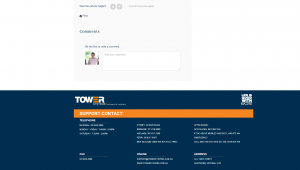 Our customers can access the new facility using their existing Tower website log in. Our live national help desk service remains in place – we’re happy to take support calls from our customers. This self-serve service is for those who want to get answers for themselves 24/7. Our approach with this launch is how we approach business. We have been developing the new content and delivery platform for some months. Today is the first time we have mentioned it as we’re ready to go live. We prefer to announce when we have something ready for people to use.